Blizzard like conditions w moderate snowfall and strong west winds were creating snow drifts 2-3’. I saw a small skier triggered and triggered one small wind slab. Both 2’ deep 20 feet wide steeper than 34 degrees. Snow drifts were low density -fist to 4 finger. Wind drifts were well down the drainage. Hard to tell pi rates with all the wind but car didn’t have much snow on it (guessing .5” /hr at car. this was the main threat today and tomorrow. per the forecast it did look white and winter but below it was manky wet. Possibly for a step down dry to wet avalanche. 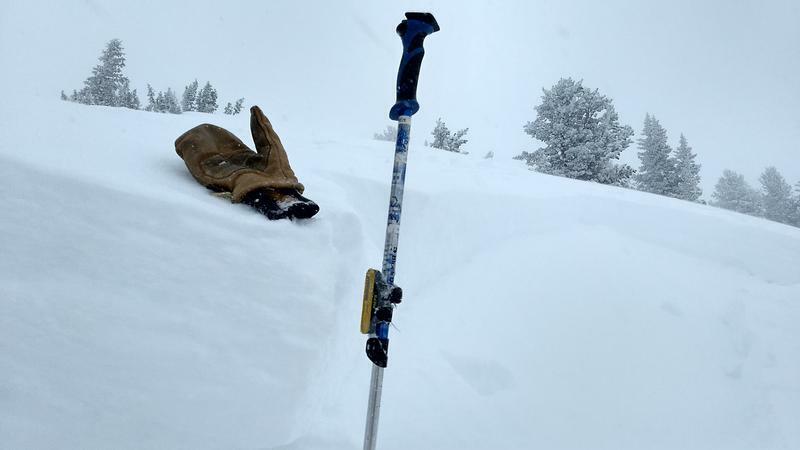 Poor snowpack structure. New snow bonded well to old snow. There was a density inversion 1” down from surface. Old snow was buried wet n sloppy. The old surface snow refroze 1” deep and was penetrate w ski pole and boot would penetrate ankle to shin depending on elevation. Ski would penetrate occasionally during bottom feeding below 9300. Above 9500 ish problem went away. I am not real familiar with this cold front setup not sure what to think. I have some theory's relating to strength and load that I won’t share, and hoping for the answer key shortly. They closed lcc canyon 2pm for avy work. Photo small wind slab skier triggered.